There’s plenty of debate about which boatbuilder constructed the first commercially viable center console boat. Some people argue it was the 16-foot Boston Whaler Nauset, which launched in 1961. Others say Aquasport created the category in the early 1960s with its 22-2. More than a few people claim Chris-Craft was first with its iconic 1964 Dory. 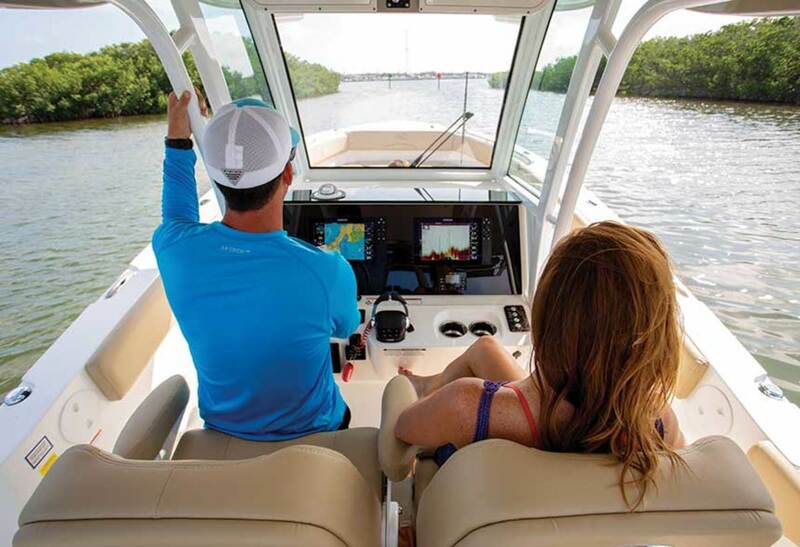 No matter which model came first, modern center consoles now range from practical, no-nonsense fishing machines to 50-plus-knot speedsters with plush, air-conditioned cabins. Some builders are pushing the limits even further. HCB, for instance, is building the 65-foot Estrella and it has more than 3,000 horsepower strapped to the transom. 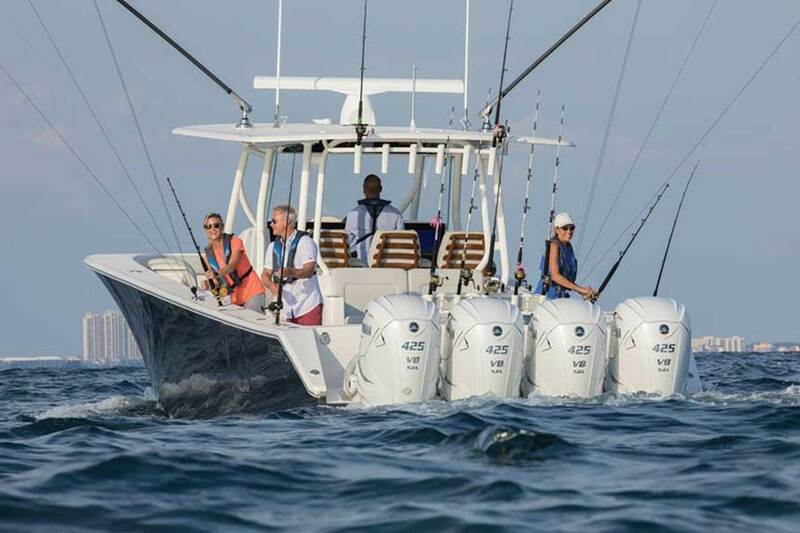 The 2019 center console models featured here are under 55 feet, among the newest on the market and built for fishing and family fun. 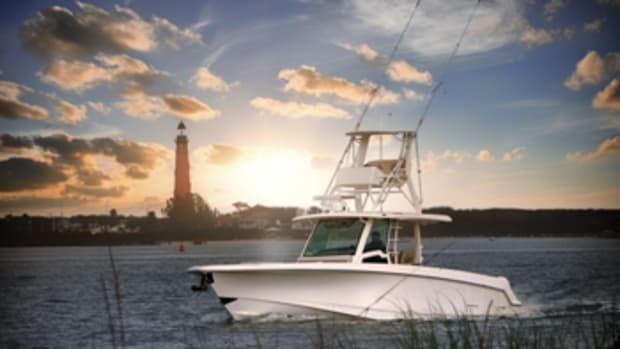 The 31 Open was the boat that started it all for Jupiter back in 1991, built as the brainchild of Carl Herndon, a former president of Bertram and the founder/CEO of Blackfin Yacht Corp. Today, Herndon’s son walks the factory floor everyday. 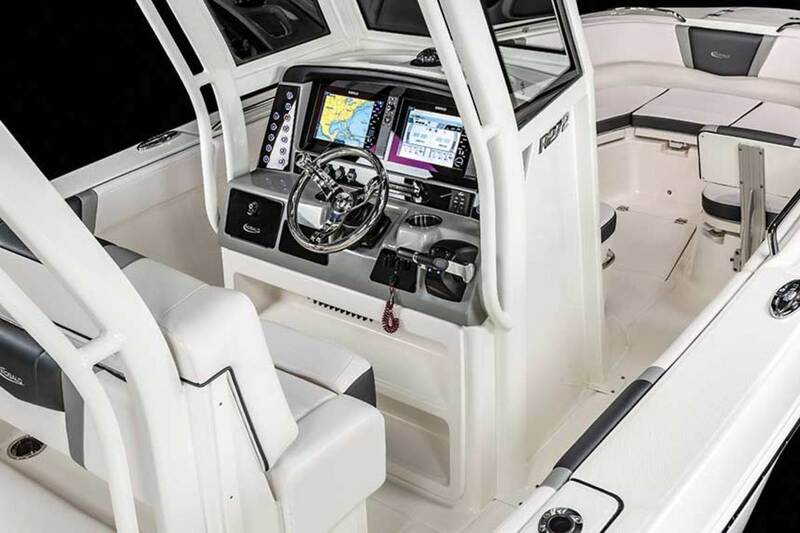 Another milestone for Jupiter came late last year, when it introduced its largest center console ever: the 43 SF. 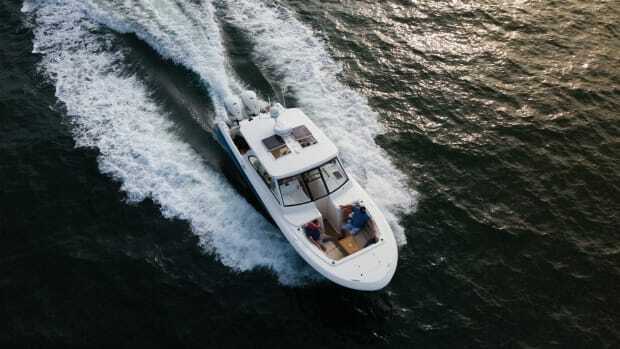 Built with an eye toward fishing, offshore performance and luxury—in that order—the boat floats on a deep-V hull with a whopping 24 degrees of transom deadrise for excellent rough-weather running. A draft of just 3 inches over 2 feet is shallow enough for cast-netting bait in skinny water, or for getting into most any coastal fishing hot spots. 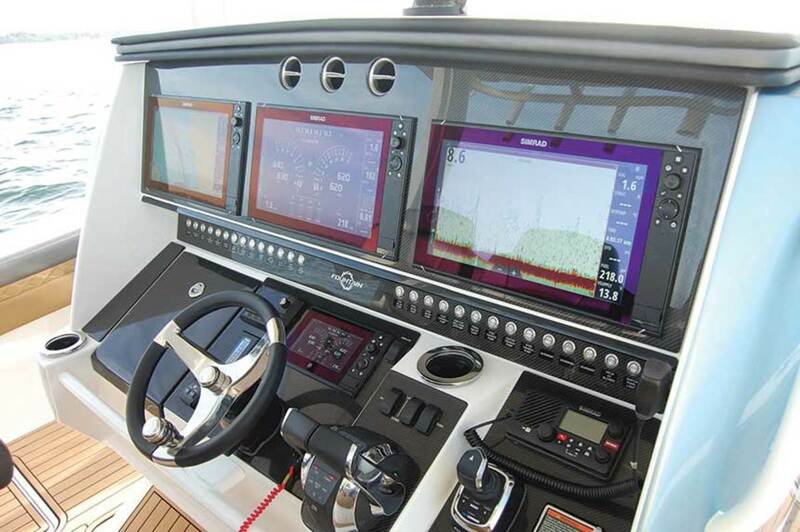 Quad 425-hp Yamaha XF425 4-strokes push this big center console up to around 50 knots, according to the builder. Though the 43 SF does have luxury features, the deck layout is uncluttered, giving the boat a classic sportfishing feel. There’s room for 360-degree fishing, thanks in part to the 12-foot, 6-inch beam. 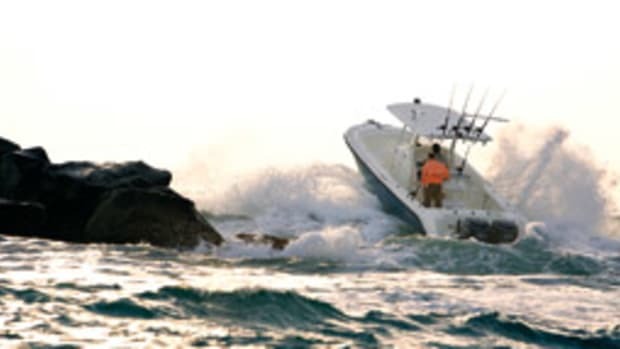 Owners will have at least 21 spots for rods around the deck, along with a livewell, fish lockers, and port and starboard dive doors for boating large fish or getting spearfishing divers into the water. The Jupiter also should prove comfortable for weekends with family and friends. 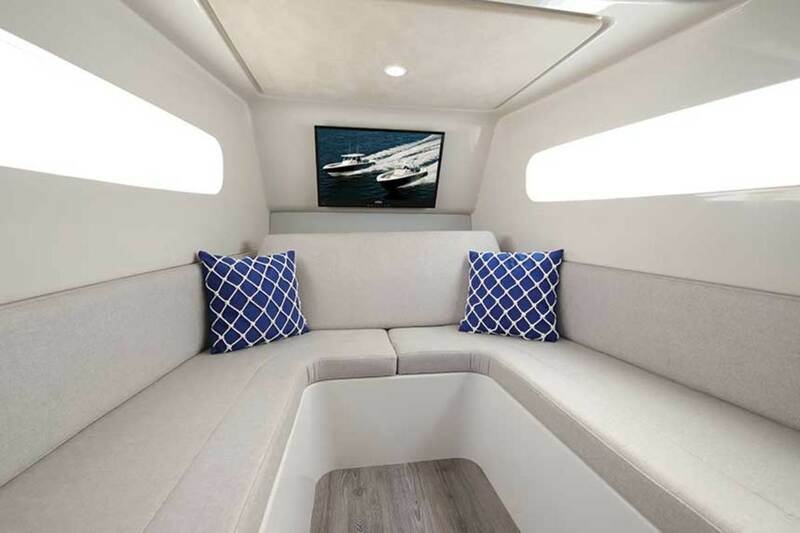 Seating areas with diamond-point embroidered upholstery are forward and aft, and the under-console cabin has an enclosed shower and head, a vanity, and a U-shaped lounge that converts to a berth. 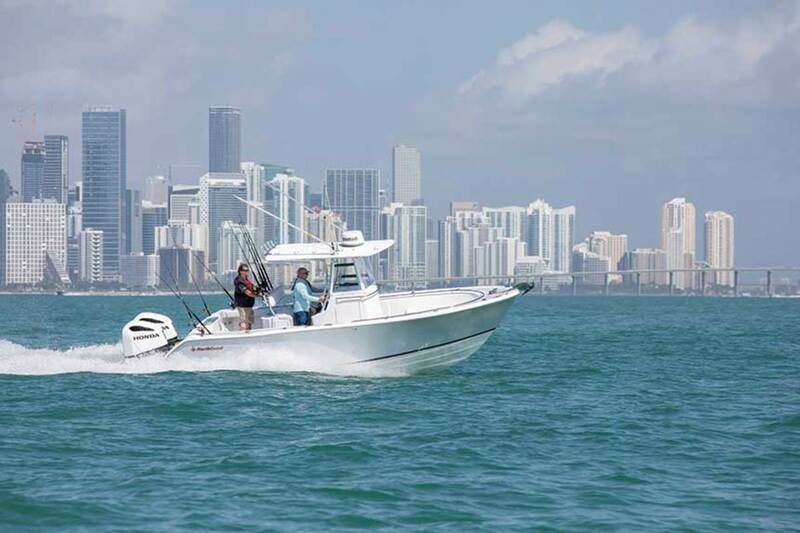 Once upon a time, Blackfin Boats produced some of the most iconic fishboats on the water. That legacy ended temporarily in 2003, but today the brand is back, having introduced numerous center- and dual-console models during the past few years. 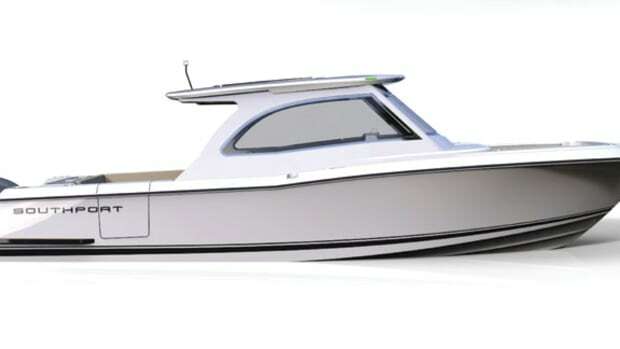 The latest is the 332cc, the biggest boat yet in Blackfin’s revival. Built with a double-step hull designed by Michael Peters, and with a deep entry and an aggressive 23-degree transom deadrise, the 332cc’s genetics are all about rough-water performance and handling. 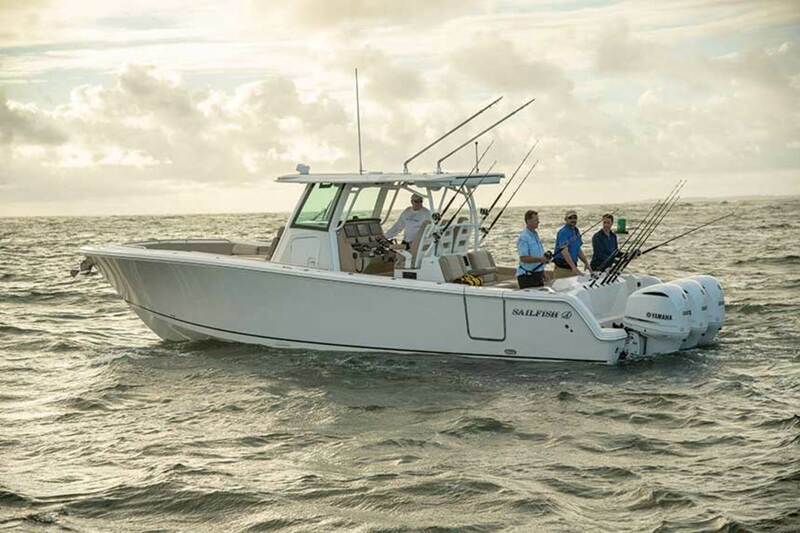 There’s also a number of fishing features on the 332cc, including a rigging station with a livewell and slide-out coolers, a port-side dive door, fish lockers, rod holders and stowage, outriggers and see-through transom livewells. Passengers can relax on bow seating that includes a two-person console lounge and two chaises, or they can head for the flip-out seating in the cockpit. USB chargers and 12-volt receptacles are strategically placed for keeping gadgets and gizmos charged. Standard power is a pair of 300-hp Mercury Verado 4-strokes. Owners can opt for Mercury or Yamaha power plants up to 850 total horsepower. The 332cc at the Miami International Boat Show had joystick steering and Skyhook, Mercury Marine’s station-keeping system. 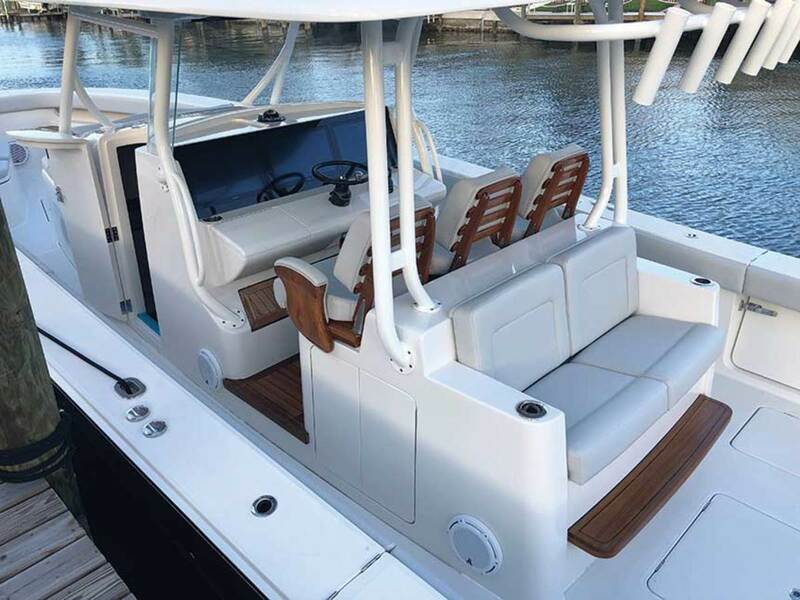 Most people equate Fountain with go-fast boats and copious horsepower, but the North Carolina builder also has a notable center console and sportfishing component to its lineup. New is the 43 NX, Fountain’s biggest center console to date and one of the most opulent boats it builds. Buttery-feeling upholstery with custom Fountain embroidery and stitching is throughout, and seating in the cockpit and bow lounge has soft bolstering. The cockpit social zone centers around an alfresco galley abaft the helm seats. The cabin has a berth, an enclosed head/shower and a galley with a sink, microwave and refrigerator under the center console. Fishing goodies include rocket-launcher rod holders on the hardtop and transom, and flush-mount rod holders around the gunwales. 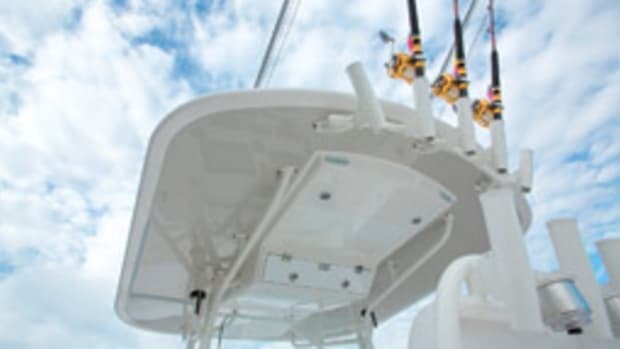 There are also outriggers, a dive door, three fish boxes with macerated overboard discharge, and three multifunction displays at the helm with fish-finding capabilities. A rack of four 350-hp Mercury Verado 4-strokes is standard, while four 400-hp Mercury Racing 400R 4-strokes are optional for a reported top speed around 50 knots. That performance is due in part to the boat’s double-step, deep-V hull and a dry weight of 15,800 pounds. Scout Boats Founder and President Steve Potts built his first boat, a 14-footer, in the 1980s. 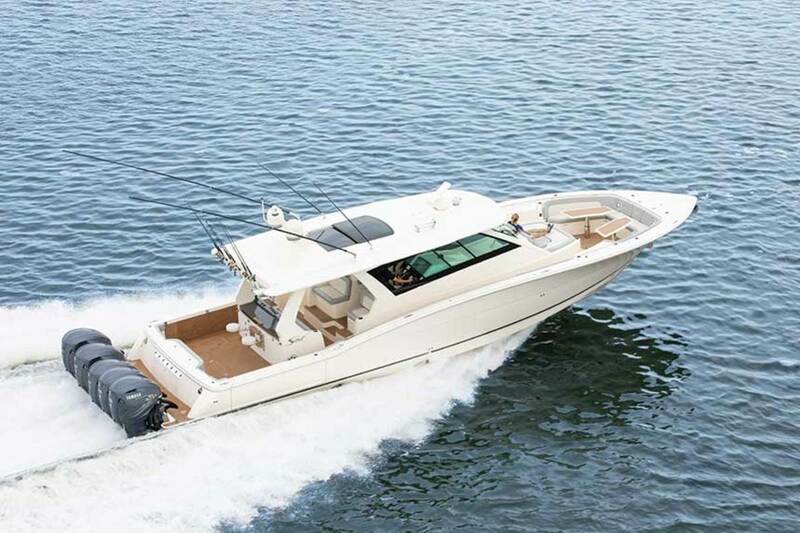 Today, the West Summerville, South Carolina, builder has a 21-boat lineup that includes its new flagship, the 53-foot 530 LXF. 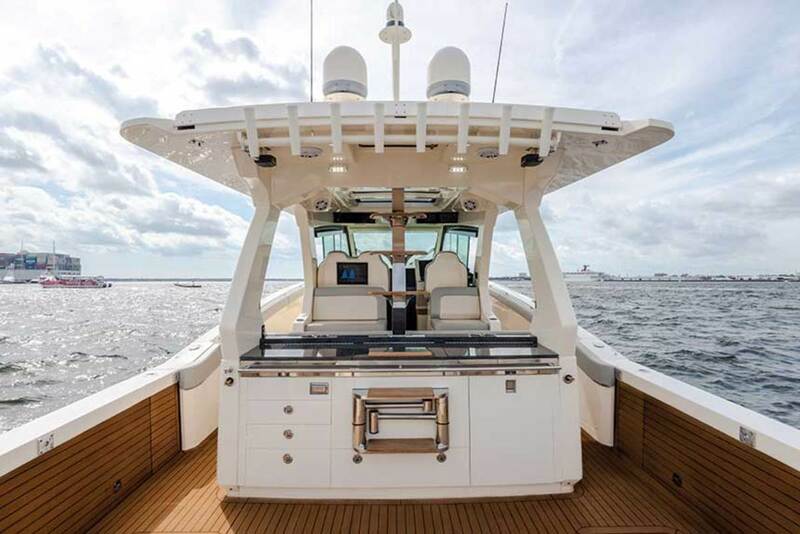 There’s a quintuple rack of 425-hp Yamaha XF425 outboards on the stern (they can push the 530 LXF to 52 knots) along with port and starboard teak beaches that fold outboard from topsides with the push of a button, creating an entertaining area in the cockpit. Close those teak beaches and the area turns into a secure space for angling. Forward of the cockpit is a bar with integral, swiveling stools, granite countertops, an electric grill, a sink with a freshwater mixer, a refrigerator and stowage. Forward of there, abaft the helm, is a conversation area with forward- and aft-facing benches. Far forward are a three-person chaise and a bow lounge for six people—perfect for libations and snacks when the action in the cockpit cools down. Below the center console is a cabin with an L-shaped dinette, a galley, a stateroom forward and an amidships berth. A touchscreen panel controls appliances, lights and machinery. 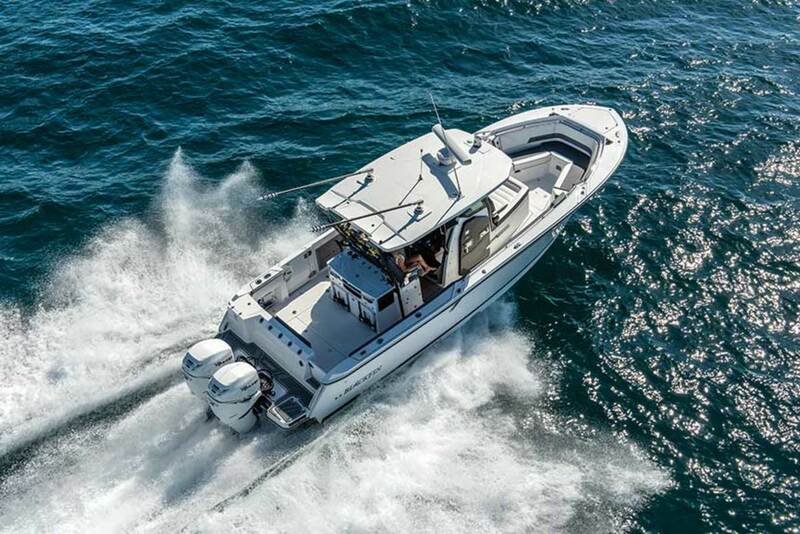 The new flagship of the Sailfish fleet, the 360 CC is best described as a comfortable offshore sportfish. The cockpit has fold-down benches that form what feels like a sectional couch in a home. Stow the seats and the space expands for fishing. There’s an 80-quart cooler and a 32-gallon baitwell under the cockpit mezzanine seats, with tackle stowage drawers behind the seat back. 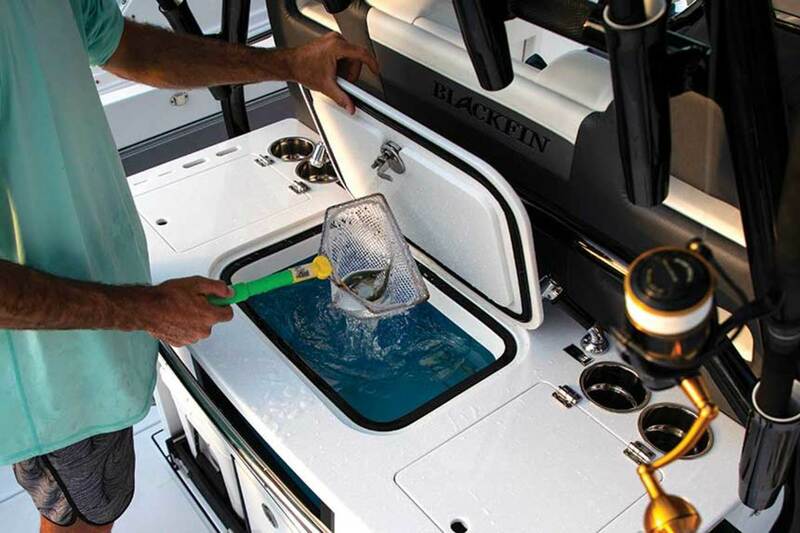 Seven rod holders line the transom, which also has a 42-gallon pressurized livewell. Larger species such as wahoo, kings and tuna can come aboard through the port-side cockpit dive door. There’s another “just like home” social area in the bow, which has chaise console seating and a U-shaped lounge with an electric table that lowers and stows flush to create a casting platform. The 360-degree fishability of this platform should help with chasing jacks or tuna around the boat on light tackle. Below the console is a cabin with a head, shower and convertible berth. Twin and triple power options from Yamaha and Mercury are available. 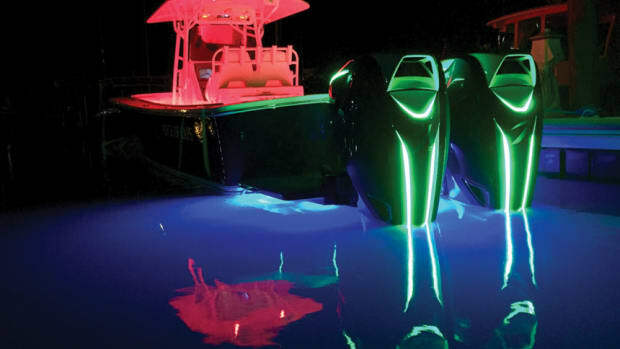 Triple 300-hp Yamaha F300s are standard and configurable up to 1,275 horsepower via three 425-hp Yamaha XF425 4-strokes. Top end with the standard power package is around 45 knots, according to the builder. For a long journey down the coast or out to the canyons, 20 knots provides the best fuel burn. 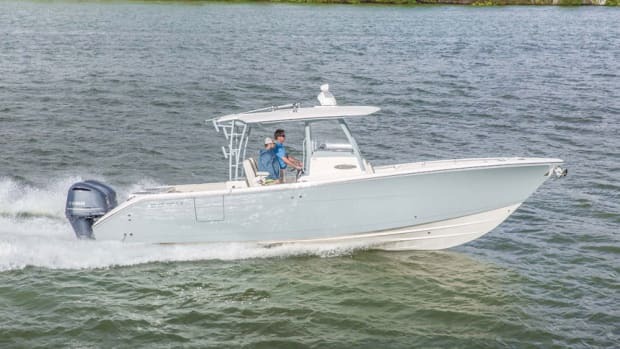 Having just celebrated its 50th birthday, Robalo has been on a tear during the past few years, introducing center- and dual-console craft from its factory in Nashville, Georgia. The latest is the R272, which nestles just below the flagship R302 in the center-console lineup. The R272 has an angled, chiseled appearance with uncluttered deck space. Among the standard features are a port-side cockpit dive door, three fish boxes with a combined 150 gallons of capacity, a 30-gallon livewell, rod holders and cockpit for rigging kite and trolling spreads, or for playing fish. Cushions can be removed from the bow lounge to make it an elevated casting deck. Likewise, in the cockpit, seats can be flipped down or away. Standard power is a pair of 200-hp Yamaha F200 4-strokes, and twin 250-hp Yamaha F250s are an option. Mash the throttles down hard, and the F200s will reportedly launch the R272 up to a top end around 40 knots. Robalo’s HydroLift handlaid fiberglass hull uses Kevlar in spots for strength and endurance. Built in Armory, Mississippi, the 32 XS Offshore is NauticStar’s biggest model since it started building boats in 2002. 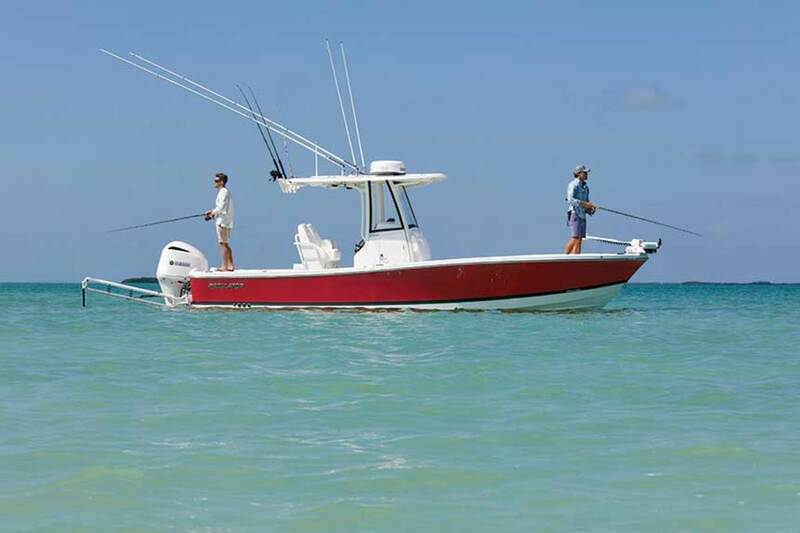 The 32 XS has offshore fishing features along with comforts for friends and family. On the short options list is a pair of 300-, 350- or 425-hp Yamaha 4-stroke outboards, or a single 425-hp Yamaha XF425. Those hefty stallions ride on the 32 XS’ deep-V hull, which has a 23-degree transom deadrise for coping with the snotty stuff offshore. Construction is 100 percent composite with no wood, and there’s a vinylester barrier coat. The hull carries a lifetime warranty. For anglers, there is a galley and tackle prep area with a sink, freshwater mixer, pullout refrigerator and stowage drawers. Underfoot are fish lockers, while a livewell and rod holders pepper the transom and gunwales. The port-side dive door is standard. The cockpit has flip-down seating, and when that seating is stowed, roominess abounds. 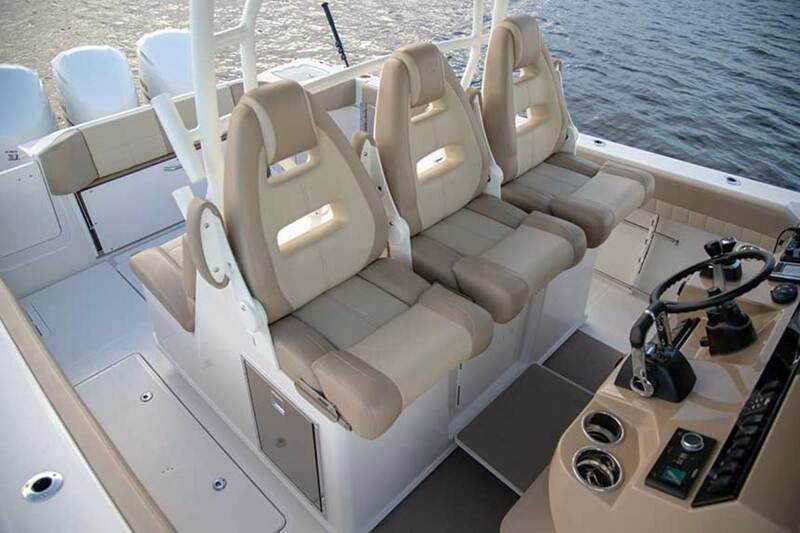 Folks not involved with fishing will likely spend a lot of time in the bow, which has a U-shaped lounge and a two-person chaise forward of the console. Under the console is an enclosed head with a sink and a freshwater mixer that can be used as a shower. 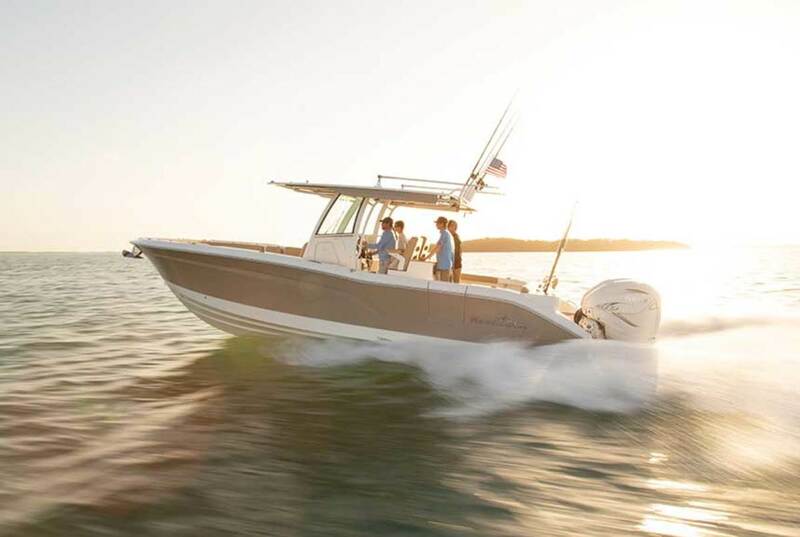 Built in Bristol, Rhode Island, the NorthCoast 280CC is the builder’s biggest model yet and what NorthCoast likes to call “a tuna’s nightmare.” With the boat’s deep-V hull, no-nonsense build and twin 4-stroke outboards, the name just might stick. 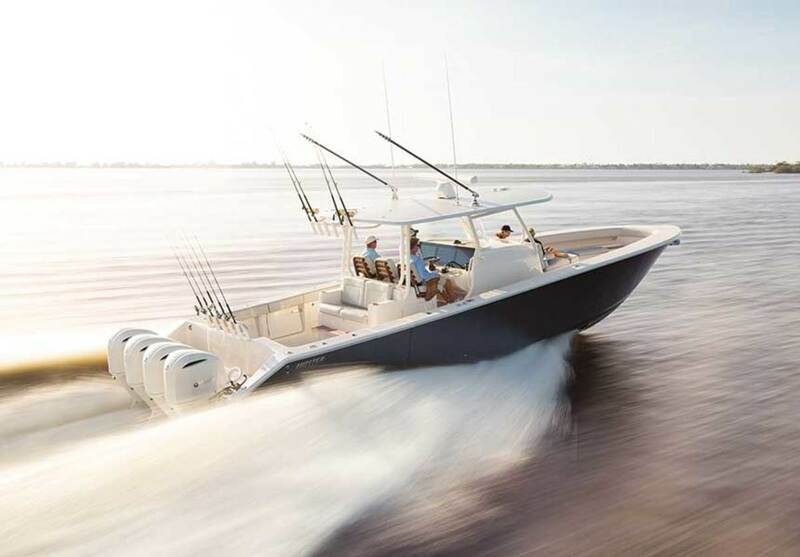 The 280CC has a practical, hose-down fishing layout that includes an in-deck, 91-gallon livewell, an in-deck fish box with macerated overboard discharge, a leaning post with tackle stowage drawers, twin forward fish boxes, rod holders, rocket launchers and an outrigger package. The under-console compartment has a plumbed and macerated head with a 29-gallon holding tank. Cushions can be ordered for the bow to create U-shaped seating. A pair of 250-hp Honda BF250 iST 4-stroke outboards is on the transom, and can propel the 280CC at more than 45 knots, according to the builder. The boat has a theoretical cruising range of around 250 nautical miles at a 28-knot cruise with the standard engines. The maximum horsepower rating for the boat is 600. NorthCoast offers Yamaha, Honda and Suzuki outboards with its new 280CC. Regulator Marine founders Owen and Joan Maxwell, along with naval architect Lou Codega, spent many hours at boat shows measuring up the competition (literally) before creating Regulator Marine’s legendary debut model: the Regulator 26. Nearly 30 years later, a new 26-footer is changing things at Regulator, the 26XO. “The XO stands for crossover,” Codega says. 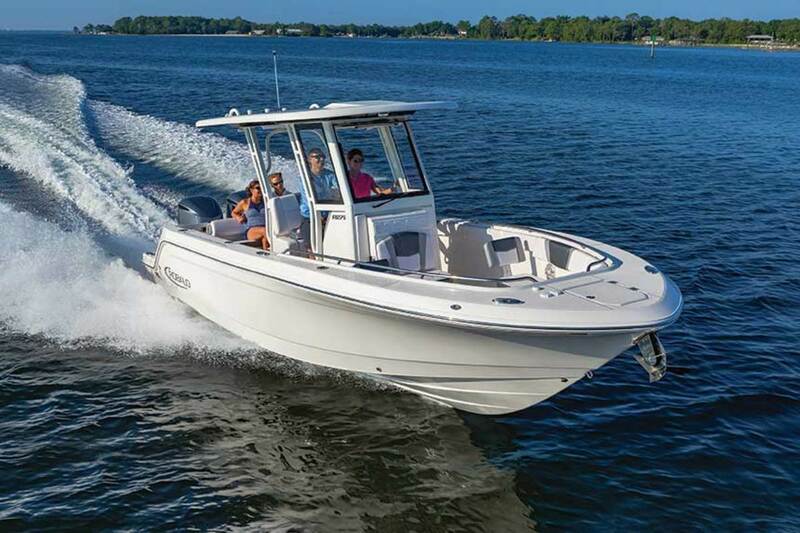 “It’s designed for inshore fishing and family fun but can easily go offshore on the right weather days.” With relatively low freeboard, a forward casting area, an aft casting deck, a Power-Pole, fish boxes, a livewell and other fishy features, the 26XO seems like it might be a bay boat—and it looks like one. But amenities including flip-down jump seats at the transom, a removable watersports tow bar, a forward U-shaped lounge and an under-console head all cement the boat’s crossover characteristics for family cruising. 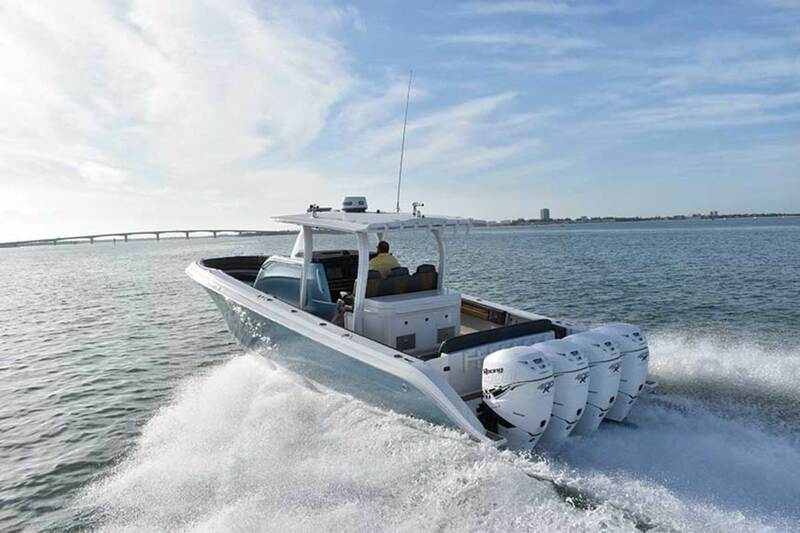 A 300-hp Yamaha F300 4-stroke outboard mounted on a jack plate gives a top speed of 40 knots, according to the builder.